In the 1960s and 70s I was living at home in London with my parents John and Priscilla Ryan. Every Tuesday morning, my pa would come downstairs from his attic studio and say: ”Hmmm WHAT am I going to do for my Catholic Herald cartoon this week? 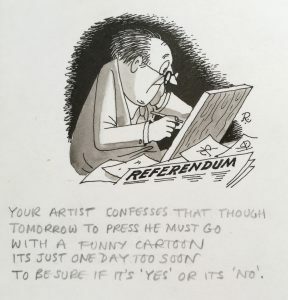 !” A thorough read of The Times, a listen to the news on Radio 4, a consultation with the Catholic Herald’s editor and a cartoon would appear, rushed by taxi to the paper’s office ready for publication – once Priscilla had rubbed out the pencil lines of the initial sketch! 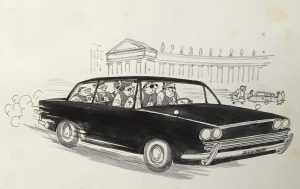 In Indian ink, white gouache for highlights and ‘zippatone’ for greys, the ‘goings on’ in Rome or in typical English Catholic – and Anglican – parishes would be depicted, through my father’s balanced and humorous lens. Priests and vicars, the zealous and the religiously indifferent, would appear, never sneered at but gently provoking a chuckle. As for me, I was utterly unaware in my teenage years of the rich source material from which my father found his inspiration: Vatican 2, Humanae Vitae, tumult and turbulence in the Church. Fast forward four or five decades and Priscilla and I received a visit in Rye. 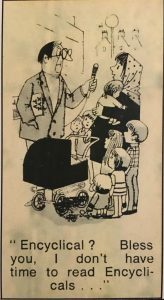 “Do you still have any of those Catholic Herald cartoons from the Sixties?” asked Dr Alana Harris, author and teacher in Modern History at the university of King’s College London. And yes, we did: originals, press cuttings, drawings on backs of envelopes – we compiled a fabulous selection to illustrate Alana’s area of expertise: the state of the Catholic church, ecumenism, the papal responses to the permissive society and the thorny issues of birth control and secularisation. Having received encouragement and permission from the Catholic Herald Alana brilliantly procured funding and a fabulous exhibition venue from King’s College London, and we set to work. The results of our labours ‘Sink or Swim? 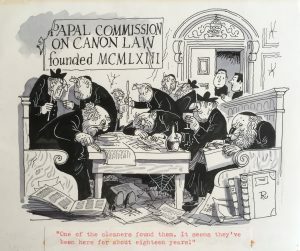 Catholicism in the Catholic Church through John Ryan’s cartoons’ exhibition can be seen until April 13 in the Weston Room, Maughan Library, King’s College London, 7 Chancery Lane, London WC2A 1LR. 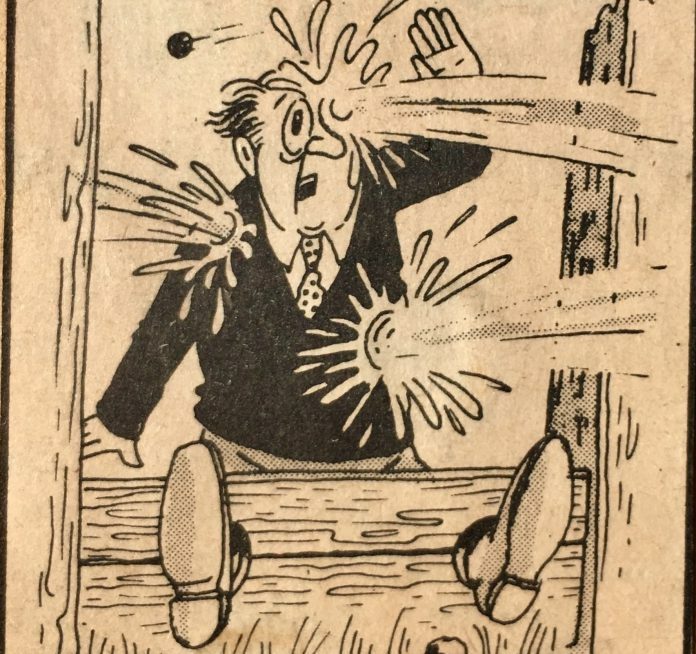 There’s a huge timeline graphic, a slideshow, text panels illustrated entirely with my father’s cartoons, and showcases with fairly fascinating Sixties archival contents. Obviously Captain Pugwash’s nose was rather out of joint at all this attention to his creator’s ‘other characters’ so we’ve given him his very own display in the corridor next to the exhibition in the Weston Room. Visitors to Rye Station may recognise the merry Pugwashian panels that adorned the ticket office’s walls in the summers of 2015-16. Image Credits: All courtesy of Priscilla and Isabel Ryan.